Does Sugar and Bipolar Mix? For people with bipolar disorder, sugar consumption can do more harm than good. That is because too much sugar can result in depressive symptoms and manic highs. According to the President’s Council on Fitness, Sports and Nutrition, most American diets exceed the recommended intake of “solid fats and added sugars; refined grains; sodium; and saturated fat.” And eating this type of diet can put you at risk for diabetes and obesity. Diabetes makes it harder for your body to metabolize sugar and can lead to serious complications, including kidney disease and blindness. One 2013 report in the Annals of Medicine finds people with bipolar are three times more likely to have type 2 diabetes, this compared to the general population. While the physiological processes of these disorders are similar, lifestyle, bipolar symptoms and adverse effects of medications used to treat bipolar are also to blame. Excessive weight puts you at risk for diabetes and antipsychotics used to treat bipolar have been linked to weight gain. Therefore, consumption of unhealthy foods, especially sugar, further increases your risk for diabetes and weight gain. Sugar intake is associated with a higher rate of depression, this according to researchers out of the National Cancer Institute, Rockville, Maryland, USA. The National Cancer Institute study specifically looked at the consumption of sweetened beverages, even diet drinks, and found these pose an increased risk for depression in adults. 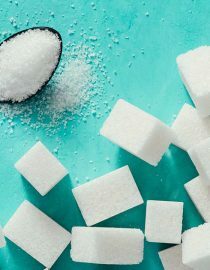 Researchers from Baylor College of Medicine in Houston, Texas have also found a connection between higher sugar intake and higher rates of depression from a major depression and bipolar disorder study. Researchers at the Universities of Manchester and Liverpool, United Kingdom, explain people with bipolar enjoy rewarding experiences and this includes consumption of sugary treats. They crave the good feelings of getting rewards, which results in unhealthy habits and weight gain. Simple carbohydrates are sugars, and most are made with one or two types of sugar molecules, for example, table sugar or candy. Simple carbohydrates are broken down too fast and the body cannot use them for energy. In contrast, complex carbohydrates are dietary starches made of sugar molecules. They are often fiber-rich starches that are satisfying, found in plant sources, and high in vitamins and minerals. Complex carboxylates include green vegetables, starchy vegetables (potatoes and corn), whole grains, beans, and lentils. Blood sugar and carbohydrate intake are important to brain health because the brain runs on glucose and relies on carbohydrates for energy. While complex carbs are a great way to promote brain health, simple ones (sugars) are not. Carbohydrates promote the release of serotonin, which creates feelings of calm and reduces depressive feelings. And lower serotonin levels trigger cravings for carbs, this according to researchers from Pontificia Universidad Católica de Chile. Low serotonin levels are the reason people with bipolar crave sugary snacks while experiencing maniac highs and depressive moods. And according to the Depression and Bipolar Support Alliance (DBSA), people with bipolar who consume too much sugar can find their moods swinging. You might wonder if you should cut carbohydrates from your diet. Carbohydrates are linked to mood-controlling neurotransmitters, they help regulate bipolar symptoms, so cutting them out entirely isn’t a good idea. What you can do, however, is swamp out simple carbohydrates for complex ones. This is because complex carbohydrates burn slowly and for more extended periods, their release of neurotransmitters is much more controlled. With sugars, the process is fast, and brain chemistry effect is quicker, more immediate and intense. Complex carbohydrates are better for you overall, and they also keep blood sugar more stable and prevent type 2 diabetes. In contrast, excessive simple carbohydrate intake increases your risk for diabetes. And when you consume sugary foods, sugar release into the bloodstream is quick and you experience a spike and then a sugar crash, which can throw off your mood. Eating more complex carbohydrates, especially fruits, vegetables, and whole grains. Getting enough protein in the form of lean meats, poultry, fish, and low-fat dairy. Protein is a good source of tryptophan, which promotes serotonin and improved moods. Eating more omega-fatty acids. According to researchers out of the University of Catania, Via Teatro Greco, Catania, Italy, increased consumption of omega fatty acids helps reduce depressive episodes and decreases the risk for suicide in patients with bipolar. Fatty fish (such as salmon and mackerel), walnuts, and flaxseeds are good sources of omega-3s. Keeping a food journal. If you keep track of what you are eating and how foods affect your moods, you will have a better idea of what foods to avoid in managing bipolar symptoms. There is no cure for bipolar, but simple lifestyle choices, especially diet, have been linked to improving mania and depressive symptoms. Something as simple is removing sugary foods from your diet and replacing them healthy alternatives can go a long way in improving your quality of life.